The one thing that we are badly missing in our Penalty Kick Game is the movement of our Goalkeeper. What good is having the goalkeeper if he doesn't move? I've had enough of it. Let's make the keeper save some penalties now. What can you achieve at the end of this post? To begin, let's create a new C# Script under the Scripts folder and name it as GoalieAnimation. We will attach it the Goalie gameobject which is the child of keeper gameobject. 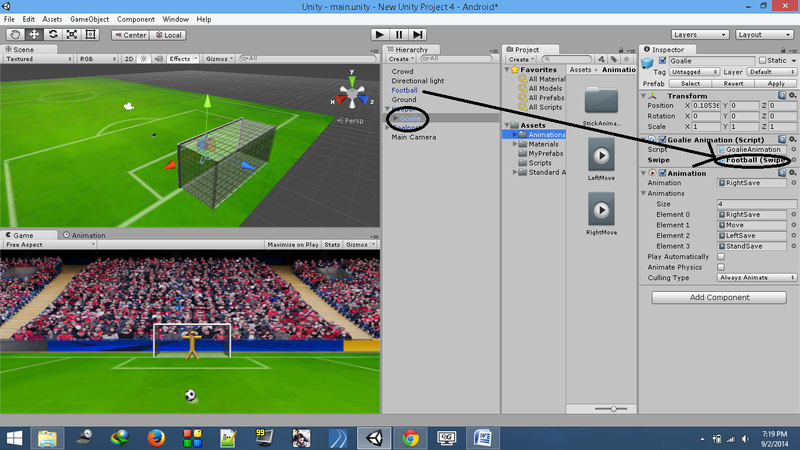 Drag and drop the Football object from the Hierarchy to the GoalieAnimation script's swipe field in the inspector. The Update function above will check whose turn it is to keep the goal and calls the respective function accordingly. In the opponentGoalie function we will generate a random number ranging from 1 to 3 and assign an animation to play for each number. We will be using the legacy animation system as it is more than sufficient for what we want to achieve. As clearly mentioned in the comments, we check the isKicked flag, generate random number in the range 1 to 3. Play the respective animation and set the isKicked flag to false so as to make sure that the animation is not played again. Simple enough! There is one thing left to code, which is the player controlling the goalie animation. We will check If it's the opponent's turn to keep the goal, if so then we see if there's a tap/swipe detected on the screen. Once the tap is detected we will add force to the ball after a delay of 0.2 seconds (This was covered in the previous post). Now we will play the animation based on the swipe direction. What this means is we swipe and animate the goalie and correspondingly the ball is shot after the swipe is detected. So, it's like one throw and two rewards. Now, we have two options to check if the screen is swiped, create a new function altogether or use the playerLogic function of the swipeControl script. Just for the sake of simplicity we will create a new function to play the animations based on the swipe direction. The above function is quite simple as we have seen it earlier. It adds the RightSave animation if we swipe to the right, LeftSave, if swiped to the left and StandSave, if we swipe up. Play to test this game, of course with Unity Remote app opened and your device connected to the computer. Stick Flick Penalty Kick Game 5: Who Is The Winner?